It was April 1975 when a Ferrari Dino took the checkered flag, or in this case, a timestamp from the Portofino Hotel in Redondo Beach, California. A young Jack May had just driven across the U.S. in the Cannonball Sea-to-Shining-Sea Memorial Trophy Dash, completing a coast to coast trip in only 35 hours and 53 minutes. 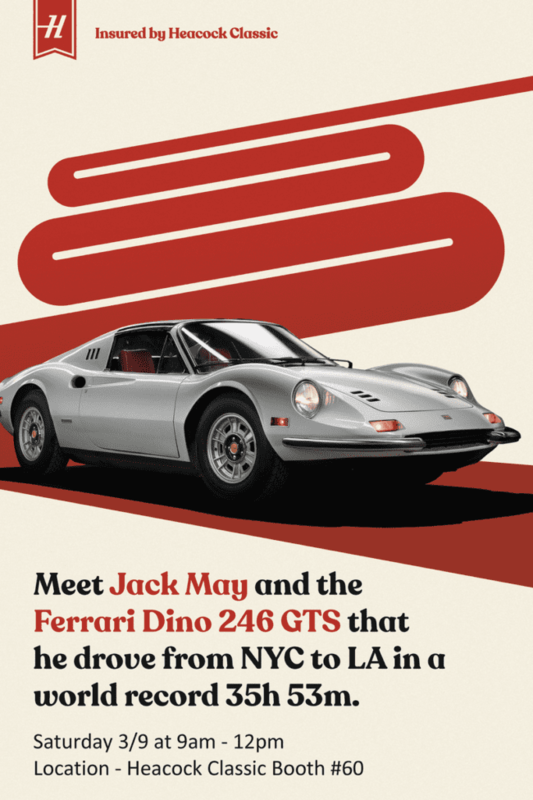 You’ve heard the story before, and may have even seen the Dino, but don’t miss your chance to meet Jack himself and get a signed poster commemorating his victory at Heacock Classic booth #60 at this year’s Amelia Island Concours d’Elegance. This event is free to the public between 9am – 12pm. Did you recently purchase a new classic car? Collectors with multiple cars and large collections have access to our lowest rates – Get Started Here!